You've just received a new claim and we want you to succeed. Below is a no nonsense approach to satisfying the request of the client and successfully closing your first claim (or second, third, etc...come back as often as you like). 1. First assignment: What to expect. 1. What is a diary and what does it matter to me? 2. When is my report due? 3. How do I know which report form to use? 4. The Short Form Narrative explained. 5. How to handle second and subsequent reports. WHAT IS A DIARY AND WHAT DOES IT MATTER TO ME? 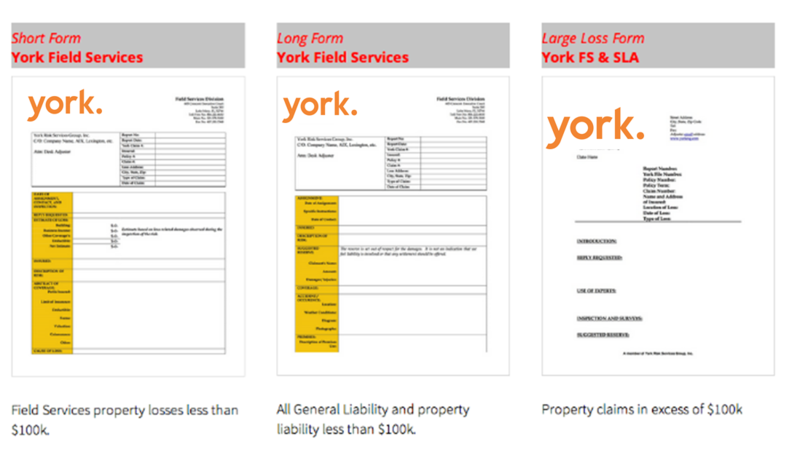 York Specialized Loss Adjusting operates on a progressive diary management system, which allows for claims to be periodically reviewed for progression and proper handling. 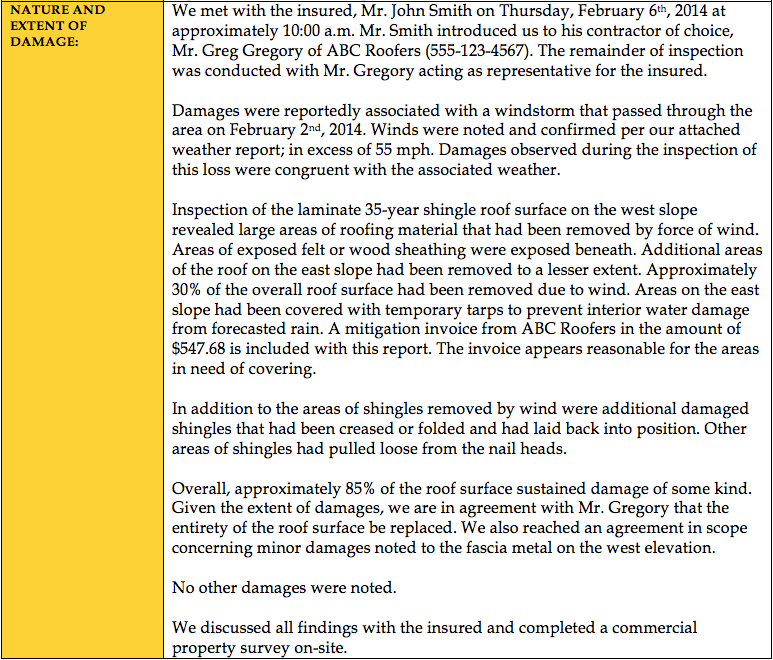 The diary is important to you as an adjuster as it allows time to fully investigate and report on the loss. Without the diary, assignments would have to be fully completed in an established timeframe, which can put unnecessary strain on the proper handling of more complex claims. Simply put, the diary allows you to efficiently handle the claim without any standard timeframe for completion. However, there is one caveat; report due dates. WHEN IS MY REPORT DUE? The due date for any report is always prominently displayed in FileTrac for each file below the ﻿Status/Due﻿ column in FileTrac. It is imperative that reports be completed and turned in on or before the date specified. HOW DO I KNOW WHICH REPORT FORM TO USE? The title of the form is at the top in italics, then the appropriate client use just below that in bold. A screenshot of the form is included, which can be clicked to download and a description of when the form should be used is below. Narrative |ˈnarətiv| noun - a spoken or written account of connected events; a story. Report No: In this cell, the report number for the current report is required. Report Date: This is the date the report was completed and turned in for review. York Claim #: This is the York Field File Number, which appears under the File Number column in FileTrac. Policy #: The policy number should be entered in full. Claim #: The claim number should be entered here, this is found below the Claim Number column in FileTrac. Loss Address: The street address of the loss location. City, State, Zip: City, State and Zip code of the loss location. Date of Claim: This is the Date of Loss. Carrier and DA Information: In the left column of the header, the carrier information and the York Desk Analyst's name is entered. 1. A representation of the gross loss in the form of a reserve. 2. A breakdown of the estimated damages as shown in an enclosed estimate or statement of loss. This section will not contain your recommendations. Any information concerning the insured should go here. This would include full business address, loss location and your contact's information. Your Description of Risk should be as accurate as possible and note any unique construction features. At a minimum, you should address year built, construction features, occupancy and any underwriting concerns. Perils Insured: Basically, the coverage form of the policy. Deductible: Policy deductible or any special deductibles. Forms: Any policy forms applicable to the loss. Valuation: Actual Cash Value (ACV) or Replacement Cost Value (RCV) as detailed in the loss settlement conditions of the policy. Coinsurance: A coinsurance percentage and abbreviated coinsurance workup should be included (example below). Other: This section reserved for any applicable exclusion or endorsement which may affect coverage. The cause of loss must relate to a peril and must contain the proximate causation. If the cause of loss cannot be determined, it may be necessary to request permission to engage an expert. As the heart of the report, this is where the bulk of the report content is placed. Not only will you recap all of the details of your inspection, but also recount the details included in your estimate and/or explain supporting documents. This section should be lengthy, full of detail and leave nothing for the DA to 'search' for. Any notable interruptions to the insured's operations should be noted here. Be sure to evaluate the policy and do not commit to coverage. As previously mentioned, subrogation is a term that refers to recovery and is not necessarily disqualified because the peril was an act of nature. Any recent work performed should be commented on, especially if this falls within the Statute of Repose for the loss state. If there is the potential for legitimate and economically feasible salvage, comment in your report. If there is the potential for salvage value for any damaged item, include a reply request in the report concerning facilitating the sale of the salvage. Potential Adjustment Issues would include any issues noted in your review of the coverages, policy period, loss type, scheduled locations, etc. Your future handling should explain what you are going to do to conclude the claim. Include details of any documentation left to gather and any communication you plan to have with the insured or their representatives.